How do I stop my dog chasing anything that moves? Posted by Betty. November 26th 2015. Before addressing the issue of how to stop your dog chasing anything and everything which moves, we need to look at their motivation for doing so. Not surprisingly, the desire to chase stems back to their time in the wild when they had a predatory reason to take part in this behaviour. Hunting for food. Just like you don’t teach a dog to dig, you don’t have to teach them to chase either. It’s instinctive. 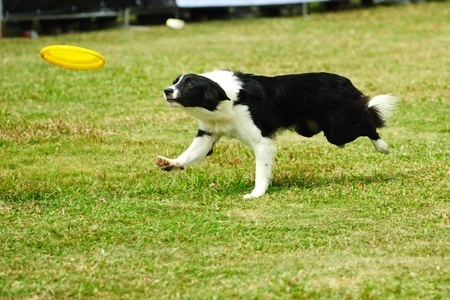 Chasing is a fundamental characteristic which dogs inherit from the ancestors. This is the main reason why some breeds like to do it more than others. Why won’t my dog stop chasing? Put simply, they won’t stop chasing because they enjoy it. More than you could ever know. In fact, the ‘high’ they receive is so big they close down all of their other senses to fully concentrate on it. And nothing you do is ever going to stop this. Not only do they love it, they NEED to do it. And unless they are allowed to do so on a regular basis, your dog will constantly be on the look-out for the chance to chase. With this is mind, it is better to try to control the object they chase rather than deny them the chance to chase. Can I help to control my dog’s desire to chase? Unlike other unwanted behaviours, giving your precious pet a treat is not going to deter or stop them from wanting to chase. That’s because they don’t value a biscuit as highly as the internal ‘high’ they will get from taking part in a chase. This behaviour doesn’t mean our pets are deliberately being disobedient, they are just obeying a stronger instinctive urge. Owners tend to despair when their dog chases after cars, rabbits, deer, sheep, runners, bikes and children because this can lead to dangerous and possibly disastrous outcomes. So, rather than see our dogs chase the ‘wrong’ target, the key is to divert their attention onto a different chase object and encourage them to chase the ‘right’ target, like a ball, frisbee or toy. Before trying to introduce a new chase object, it may be an idea to try to add other things into your dog’s life which will improve their emotional balance. Giving them a new food or experience may help to reduce their need to get a ‘high’ from embarking on a chase. 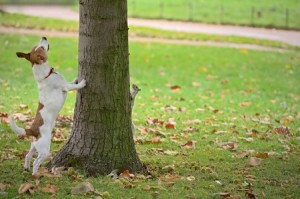 If they like to chase specific objects, like rabbits, don’t take your dog anywhere near them on their regular walk. If their desire to chase is preceded by stalking or searching, keep an eye out for this mannerism. It is also still important to stay aware and watch for other potential triggers, though, like runners or bikes. As well as changing your walk route, try keeping your pet on a lead at all times to reduce their desire to bolt and run. Next you need to train the part of their brain which is desperate to chase – and introduce a chase object you can control. Be inventive and make the object similar to the one they used to like chasing most. It must not be the same, though, or you will reinforce their old behaviour. 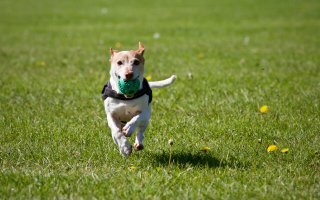 Practice getting your dog to chase after it in a place where there are no distractions and do it every day so they get into a new routine. Once your dog is desperate to play the game, it may be a good idea to hide the ‘chase’ toy so that you creates that a buzz when they see it on the field. Remember, you must keep this game up on a regular basis or your dog will go back to finding its own target and you’ll be back to square one again.